Sweden: Tibetan spiritual leader His Holiness the Dalai Lama on Wednesday reiterated that Tibetans long to return to Tibet and are willing to remain within the People’s Republic of China given that China respects Tibetan distinct culture and autonomy. 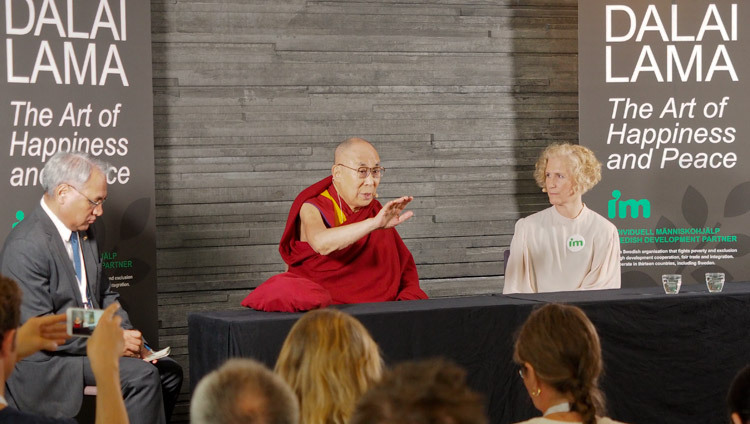 Speaking at a talk on ‘Art of Happiness and Peace’, organised by Individuell Människohjälp (IM), His Holiness said, “As Tibetan refugees, now about 60 years, we always think about going back to Tibet and to rebuild Tibet. We want to be broadminded, not narrow-minded. Therefore, we are very much willing to remain within the People’s Republic of China given that they respect Tibetan culture, language, environment. These are in accordance with the Chinese Constitution. The event was being held to commemorate the 80th anniversary of the Swedish aid organization Individuell Människohjälp. “Now things are changing, firstly historically, Tibet and China have shared long and close, dating back to over thousand years. Recently, we have been passing through a difficult period but that will change,” he said with optimism. Sharing his opinion on refugee rehabilitation, His Holiness said ultimately refugees should focus on developing their own countries. Countries with the opportunities to receive and help the refugees must do so but only to provide the immediate relief and resources and education for the youths in order to support them rebuild their country. His Holiness responded, “If we make efforts starting now, with vision then later part of the 21st century can be more peaceful and happier. “We need to find out what are the roots of today’s problems; not through religion but through education and awareness. We must use our intelligence with scientific research. Then in two or three decades, the new generation who have received a more complete form of education will see a world that is more peaceful and happier. Tomorrow morning His Holiness will give an audience to the Tibetan community members and Tibet supporters from Sweden and nearby Scandinavian countries. He will also give interviews to two leading media organisations in Sweden. This is His Holiness’ first visit to Sweden since 2011.